The side panels of the Hoplite can be removed by unscrewing a pair of thumbscrews; an act that will reward you with a view of the matte black interior of the case. Getting a good look at the internals of the case will also give you a chance to fiddle with some of the more unusual features here. At the top of this list of design quirks is the unusual 3.5in drive cage, which is located behind the intake fan and has a hinged cover over it when you first take off the side panel. To gain access, you’ll need to unscrew the thumbscrew at the top of the cover and then swing it open. This rigmarole makes adding or removing hard disks something of an event, but it's difficult to see a practical purpose for this door; it’s not for security, as it’s only fastened with a thumbscrew, and it’s unlikely to be a thermal management feature as it actually stops the waste heat from the hard disks escaping. Opening up this door and peering inside the hard disk cage also reveals one of the key issues with the Hoplite - the lack of ventilation behind the intake fan. 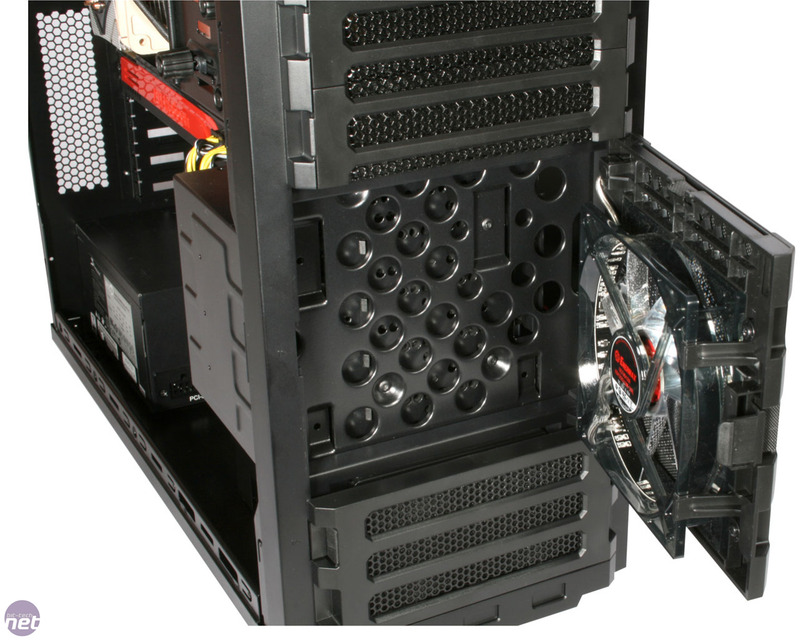 It’s the job of this fan to push air into the case to help cool the components, but the hard disk cage behind the fan is constructed almost entirely from solid metal; there are very few ventilation holes cut into it. This stops the intake fan doing its job, and means that very little air gets properly pushed into the case. As a result, the CPU and GPU coolers have to rely on what air they can pull into the case themselves via the meshed front and side panels. Aside from this curious design choice, the rest of the Hoplite's interior will be familiar to anyone who’s looked inside a case in the last few years. 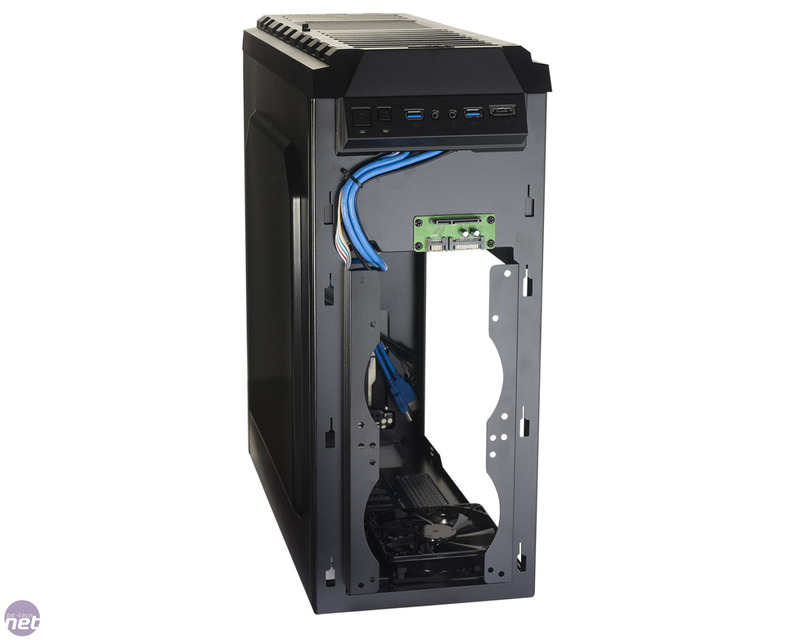 The PSU mount is at the bottom of the case, as is becoming usual, and there is a 120mm fan in the normal rear exhaust position too. There are also plenty of cable routeing holes cut around the motherboard tray, most of which are lined with rubber grommets. This makes building a tidy-looking system inside the Hoplite a relatively simple task. Our only gripe when it came to building the system was the lack of space behind the motherboard tray. The extruded side panel helps here a little, but it was still a squeeze to route our fat 24-pin ATX power cable into our desired position. 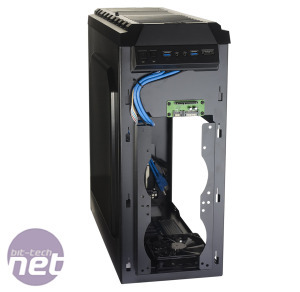 All of the drive bays also boast screw-less fittings, meaning it’s simple to swap hard disks or optical drives in and out of the Hoplite. There is little concession to noise reduction, though, as neither the 5.25in nor the 3.5in fittings have any kind of rubber grommets to reduce vibrations. Supports up to E-ATX boards. Can the CM Storm Enforcer stamp its authority on our thermal test kit or is it a pushover?